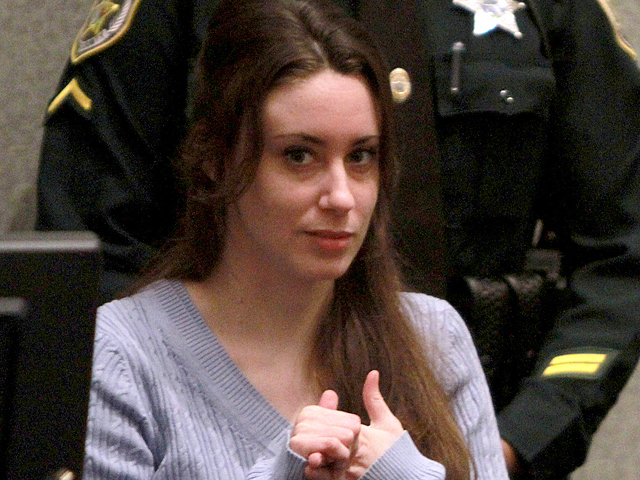 (CBS/WKMG) ORLANDO, Fla. - Casey Anthony, who has been laying low since a jury acquitted her of murdering her daughter Caylee, has reported to the Florida Department of Corrections to serve one year of probation on an unrelated check fraud conviction. According to CBS affiliate WKMG, Judge Belvin Perry ordered Anthony to report by noon on Friday after an appeal filed by her defense team was denied earlier this week. In Jan. 2010, Anthony was convicted of check fraud for stealing checks from then-best friend Amy Huizenga during the month in 2008 that Anthony's daughter was missing before being reported. Her defense said Anthony served probation while at the Orange County Jail while awaiting trial on charges that she murdered Caylee. Anthony was found not guilty of all felony charges in Caylee's death last month and subsequently released from the Orange County Jail. The original judge in the case, Stan Strickland, revised his order to clarify that Anthony was intended to serve probation if she was ever released from jail. He recused himself from the matter and Perry took over. Anthony's whereabouts have been a mystery since her release from the Orange County Jail on July 17. On Monday, her attorney Jose Baez said Anthony had returned to Florida in case it was necessary for her to report for probation. WKMG reports that The Department of Corrections will hold a news conference to discuss Anthony's probation at 11 a.m. Thursday in Tallahassee. Anthony was not required to report for probation in Orange County and it is unclear where she decided to report.